The Christmas tradition of the Peppermint Pig™ originated in the 1880's when Jim Mangay, a candy maker in Saratoga Springs, New York cast candy pigs from hardened peppermint. It's thought that European chefs who worked at Saratoga Springs' hotels influenced him. They originally wanted him to make pigs from marzipan, but since that particular candy was not easy to obtain, he improvised. A fun and affirming tradition evolved. After Christmas dinner, the head of a household would place a Peppermint Pig™ in a velveteen bag and break it with a small hammer. the Peppermint Pig™ would then be passed around the family table so that each person gathered could give it a tap. When it was your turn, you had to recount something good that happened that year. The diners would then eat the pieces while hoping for prosperity. Why a pig, though? Wouldn't a reindeer be better? 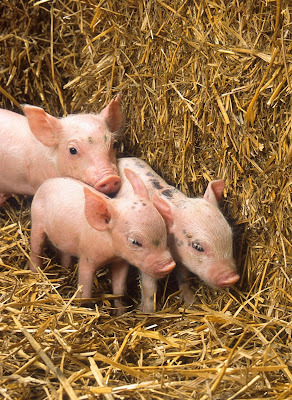 Turns out that in Victorian times, the pig symbolized good health, happiness, and prosperity. This may have evolved from earlier peasant cultures. Sugar rationing during World War II ended the making of the pigs, and then the older candy makers began to die off. Forty years went by. The tradition of the Peppermint Pig™ almost died out. But then another Saratoga Springs candy maker brought them back. Older residents of the town urged Mike Fitzgerald to make the pigs again shortly after he opened his candy shop, Saratoga Sweets. He obtained an original mold, and in 1988 made his first batch of 60 or 70 pigs. Today the Peppermint Pig™ is sold online, as well as through catalogs, museum shops, and retail stores. Orders come in for several thousands of the candy pigs, and Saratoga Sweets usually runs out of them. Batches are made in small quantities to ensure quality control, and the candy is made with the same ingredients that were used over a century ago, and the molds used are replicas of the originals. As Mike Fitzgerald observed in a post for All Points North, "It turns into a really positive family tradition. It provides closure to the year...I think these guys back 120-years-ago had a pretty good idea." 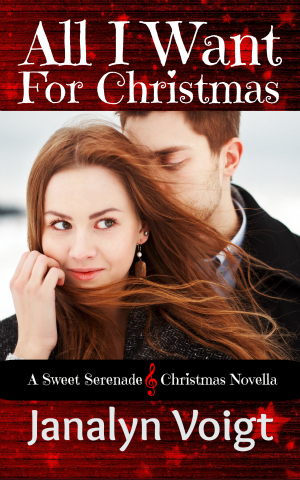 Five commenters will receive a complimentary Kindle copy of Janalyn Voigt's brand new Christmas novella. Comment today, December 8th, to enter. Hailey may just give up on men entirely. When Corey broke her heart, her best friend Matt helped pick up the pieces. Matt made his interest in her no secret when they first met, but seemed happy to accept a friendship, at least until now. With Corey looking her way again, Matt has started acting funny. If Matt wasn’t a cubicle worker who moonlights as a Seattle street musician, this could have been easy. Hailey can’t afford a drag on her ambitions. She needs to climb the career ladder to keep her childhood home, all she has left of her parents. After Amy ditched him for a man with more money, Matt isn’t about to tell Hailey that the ‘fiddle’ he carries is a Stradivarius or that he owns a tuxedo. Let her love him for himself or not at all. 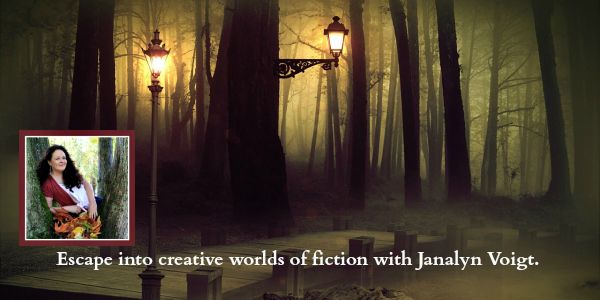 Janalyn Voigt's unique blend of adventure, romance, suspense, and whimsy creates breathtaking fictional worlds for readers. Look for her upcoming western historical fiction. She also writes fantasy. Beginning with DawnSinger, Janalyn's epic fantasy series, Tales of Faeraven, carries readers into a land only imagined in dreams. Janalyn is represented by Wordserve Literary Agency. Her memberships include ACFW and NCWA. 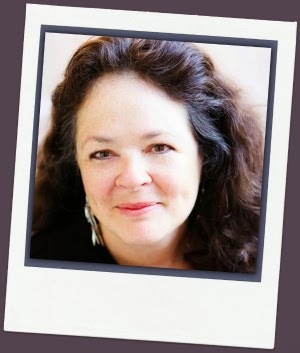 When she's not writing, she loves to discover worlds of adventure in the great outdoors with her family. Fascinating and fun. love to learn new Christmas Trivia. This sounds like a fun little tradition from way back when. I love hearing about old family traditions. Thanks for sharing! I have always wondered what the deal was with the peppermint pig at Christmas time and now I know. Thank you for sharing! 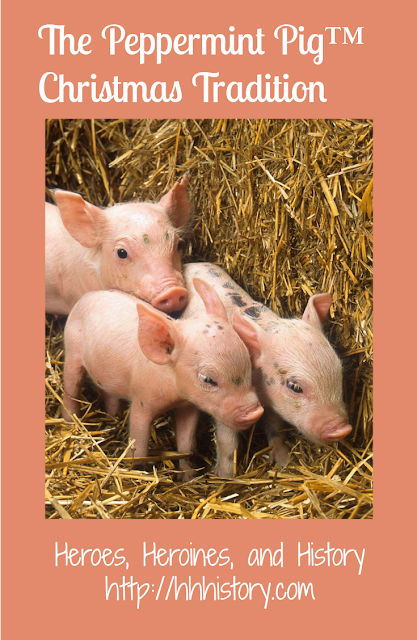 Our children raised pigs for show projects many years ago and pigs are still a favorite of mine, candy or otherwise! I wondered the same thing, Melanie, which is why I wanted to research and write this post. It was a lot of fun. Janalyn Voigt is a new-to-me author. The brief description for this book has piqued my interest and I will be adding it to my TBR list. I've never heard of the Peppermint Pig, but it sounds like an interesting tradition. I wonder if those farmers had Ham for Christmas dinner. Janalyn, your new Christmas book sounds great. You made me smile, thanks. I've never heard of the Peppermint Pig, so neat that someone resurrected it! Your novella sounds good. I recently married, and certainly didn't marry my husband for money, fortune or fame, I married him for his heart! It's nice when history is preserved like this. Good for you on knowing what's most important. The book sounds great, thanks for the chance to win a copy! I do so love Christmas stories this time of year....or anytime really. You're welcome, Trixi. I love anything that fosters community within a family.